UPDATE @ 3:27PM - This is obviously an extremely popular deal. It looks like the cheap fares are selling out on certain dates. Can still see cheap ones in November, December, and a couple in February. January, March and April seem to be sold out of the cheap fares now. I believe this is the craziest price I've ever seen to Hawaii, from anywhere, in the U.S. or Canada. Allegiant is offering flights from Bellingham to Honolulu, Hawaii for $99 each way, after taxes & fees. UPDATE: Maui is also available for the same price! The affected dates look to be November 2012 through to April 2013. Just be aware that Allegiant charges extra for everything, including even carry-on luggage now. flight deals, bellingham, bli, honolulu, hawaii, hnl, united states, allegiant air, maui and ogg. 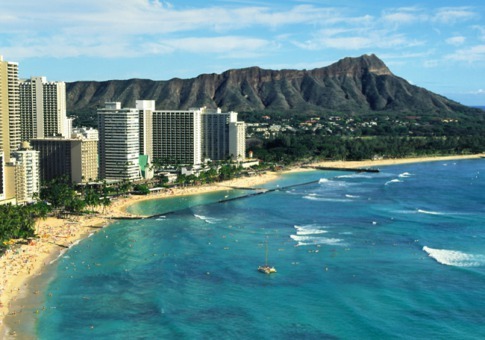 16 Responses to "Bellingham to Honolulu, Hawaii - $198 roundtrip after taxes!" I find it interesting how they have the Debit card discount. sooo cheap! but of course the downside is flying on allegiant. i want to say i'd recommend this really cheap deal to all my friends, but i wouldn't want to put them through the experience of flying this airline. oh well. Yeehaw! Did it! Flights to Hawaii in Feb for under $1000 for the three of us! What a deal--even with the silly extra charges! Totally agree with Alex! ^^ I'm flying with Alaska in December.. Not too sure how I feel about flying with Allegiant over a large area of water! Then again, $200 is unbeatable.. But add in your cost of a carryon.. or checked in.. You might as well just book Alaska for piece of mind. Never flown Allegiant, but it can't be worse than Hawaiian Airlines. Consistently THE worst experiences flying (and I fly a lot). Maui is also on sale for $99. We booked it! Thanks so much Chris!!! $50 extra for bringing a carry-on bag. Still a great deal nonetheless. Thanks Chris! What dates are 99 for Maui? We got $99 going and $139 coming home. Add to that the cost of a carryon bag plus one checked bag among the three of us, plus stupid seat selection fees, the price per person still came out to just over $300 each. Yes, some of the dates are well over $99--like around spring break. But there were lots at $99 and $139 when I looked yesterday. Not sure how much is left now that it has been on the news this morning! The seat selection fees are steep. Just don't select a seat (or any of the other add-ons), and you'll get the price as quoted above where available. We plan to bring one big piece of luggage between us to keep the baggage fees low. Afterall, it's Hawaii! How many clothes do you need?